Toulouse, France, September 29th, 2017 – Genoskin launches a new skin model to study skin inflammation. InflammaSkin® is a T cell-driven skin inflammation model with a psoriasis-like phenotype. The pharmacological validation of this psoriasis skin model will be presented at the 47th annual ESDR meeting 2017 (Poster 100) on September 27th to 30th, 2017. Don’t hesitate to visit us in booth #9. A large majority of human diseases, including skin diseases such as psioriasis, directly or indirectly involve the human immune system(1), which generates inflammatory response. To develop anti-inflammatory drugs, the use of preclinical immunocompetent skin models is required, especially models that closely mimick inflammatory features in diseased skin, such as psoriasis (2). Today, to investigate the mode of action of new drugs and assess risk, most studies use animal models with either spontaneous or induced inflammation as well as humanized mouse models. However, animal models often fail to efficiently predict human immune response, leading to high failure rates in drug development in the very expensive clinical trial phase (3 – 8). In 2014, the cost of drug development was estimated at over $2 Billion per successfully launched drug. Notably, only one out of every ten drugs that were validated during preclinical testing, was finally approved (9, 10). As a consequence, scientists are encouraged to improve preclinical testing procedures and develop alternatives to animal testing while respecting the 3R guidelines (reduction, refinement and replacement of animals in experiments), the seventh amendment to the EU Cosmetics Directive 76/768/EEC as well as the current roadmaps of pharmaceutical and cosmetics industries (11, 12). One of the new alternatives to animal testing consists in incorporating immune cells in reconstructed skin models. However, these skin models still lack tissue complexity and immune cell diversity. Moreover, skin barrier function remains immature and does not allow for the repeated topical applications of drugs. To overcome these issues, the Genoskin team has developed and characterized a patented T cell-driven skin inflammation model based on the NativeSkin® explant technology. Our approach consists in an in situ activation of resident T cells by injection into the skin. 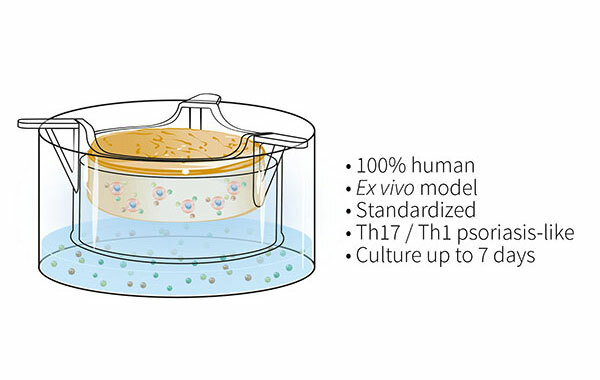 The injected skin models are then cultured for up to 7 days with a chemically-defined culture medium supplemented with a pro-inflammatory cytokine cocktail to induce Th17/Th1 T cell polarization. Histological analysis of the inflamed skin model shows characteristic changes in the epidermis in contrast to non-inflamed skin models. The analysis of cytokine levels in culture media at days 4 and 7 showed sustained secretion of IL-17A, IL-22, IFN-g and TNF-a as well as the lack of IL-4 expression, supporting successful activation and differentiation of Th17/Th1 cells. Furthermore, secretion of T cell cytokines resulted in epidermal activation shown by over-expression of S100A7 and Keratin 16. The model’s pharmacological response was evaluated in both a therapeutic as well as a prophylactic setting using one daily topical application of a PDE-4 inhibitor or betamethasone dipropionate. Results showed that both compounds and treatment settings led to strong reduction in secretion of inflammatory cytokines, restoration or preservation of epidermal integrity and viability, indicating anti-inflammatory effects. The newly developed InflammaSkin model is a fully human ex vivo skin model that successfully reproduces key features of skin inflammation observed in psoriatic lesions. The model can efficiently be used to assess the efficacy of topically applied test compounds. (2) Bergers LI, Reijnders CM, van den Broek LJ, Spiekstra SW, de Gruijl TD, Weijers EM, Gibbs S. Immune-competent human skin disease models. Drug Discov Today. 2016 Sep;21(9):1479-88.